Arkane Studios, a developer built with a team of gaming industry veterans, has created a wonderful world of revenge, choice and stealth. Dishonored puts players in the boots of Corvo, a guard to the Royal Empress of Dunwall. Dunwall is a strange whaling city where whale oil has been harnessed to support a whole manner of wicked machinery. Under Corvo's watch, the Empress is murdered, her daughter is kidnapped and the city falls to plague. Corvo takes the blame and is labelled a traitor. Players must use stealth and smarts to escape a prison and start down the path of revenge. Is this brand new IP something you should be playing? Choice in exploration and combat.Mission-based linearity. I'll admit that I was surprised by the way Dishonored has been built. Rather than giving gamers an open world with a small base, Dishonored gives gamers a linear story with a tiny hub. You'll get to the hub, go on a mission, get back to the hub and go on another mission. This linear delivery leads the experience into a focused corridor where the story is constantly driven in a forward motion. The linearity isn't such that each mission stands completely alone. You'll do or find things in an early mission that will greatly affect your play in later missions. For instance, by taking the time to explore an environment early in the game, I found a key that made my traversal through a much harder level later on that much easier. Elements like that one are what makes exploration in the world of Dunwall so important. First, exploring presents the game to players in unique ways. You'll miss a whole lot if you run right through the center of this world, and you'll only have yourself to blame. 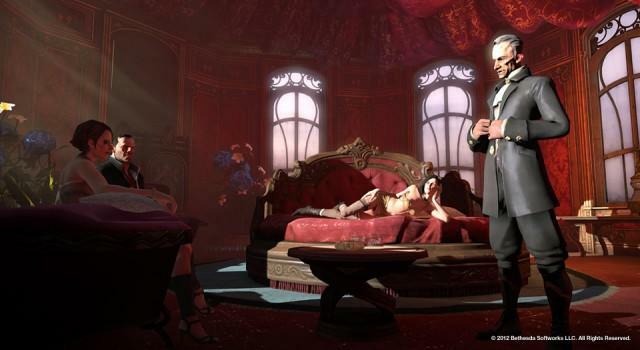 Second, Arkane has made it so that exploring each mission rewards players with a whole manner of loot and good fortune. Plus, by breaking the game apart into missions, Arkane is able to present gamers with a scoresheet as they finish. You'll look at the damage you inflicted, how many people noticed you and the chaos you've created and your instant reaction might be "I can do better." Subsequent playthroughs become more fun based on this information. It's a shame, then, that the game arrives without a New Game Plus mode where you'll be able to play through once more with all of your powers. Start the game over, and you'll start with a completely blank Corvo. Rather than giving gamers an open world with a small base, Dishonored gives gamers a linear story with a tiny hub. 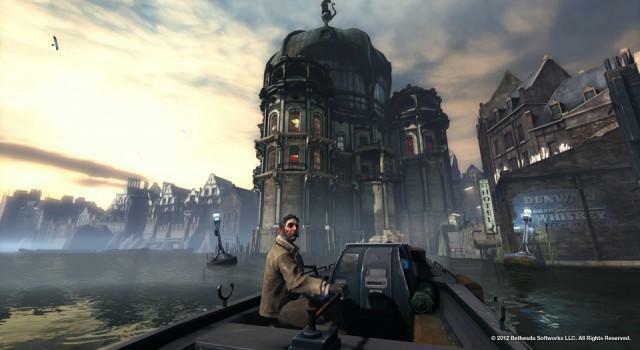 With Dishonored, you'll quickly learn that the best way to move through the game's missions is to do so methodically. You could blast through the front door of every hideaway and mansion in order to take your foes on headfirst, but you'll want to take the high or low roads and avoid altercations altogether. 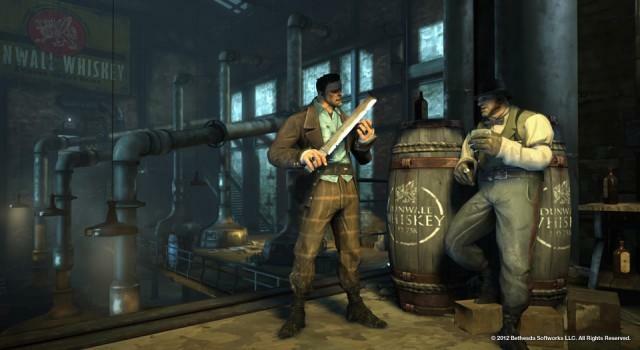 If you put three gamers in three separate rooms and had them each play the same mission in Dishonored, I'd wager money that they'd each beat the mission in a different way. There are so many paths to take that lead you through so many different moments that the experience you have from the beginning of the mission to the end will differ massively from someone else. Arkane did a wonderful job making sure that players felt strong as Corvo; but, you don't feel so strong that you'll want to take the Rambo route on every ocassion. Instead, you'll possess a rat, scurry through some vents, teleport onto chandeliers, crawl through open windows, knock your target out and take another step towards revenge. Dishonored is such a joy because it rewards classic stealth thinking with great moments. Slinking through an entire mission unnoticed produces an exceptional thrill, and it's one that will push you towards playing that way throughout the full game. With all of that in mind, the AI can be pretty stupid at times. They'll discover you, and all you'll need to do is hunker over a ledge for a few seconds before they give up and go back to milling about. Would it kill you to crack a joke? My first major complaint comes, perhaps, as an element of personal taste. The world of Dunwall, the fallen city that Corvo conquers in his ascension to revenge, is a dark and dreary one. As expected, it's been riddled by rats, consumed by plague and overrun by Weepers (this game's version of the undead). Its remaining inhabitants are mostly sick and twisted in one way or another. It's empty, and it is relentless. Now, I say this complaint may have formed as an element of personal taste because I like my dramatic narratives to deliver a little humor. Comic relief is an essential component in great story telling. It makes dark storylines more relatable, and a few laughs give audiences a chance to back away from the darkness and breathe. Constant despair in games like these make despair seem less perilous. Breaking that despair up with humor would give more weight to the madness. Dishonored arrives without any sense of humor at all. I'm not suggesting that Dunwall should be a world of poop jokes and narrator insults; however, the dark world has no personality other than being dark. All the mysterious NPCs you meet exude either madness or cruelty. There's no humor. While the beauty in combat, exploration, choice and stealth is undeniable, I will suggest that the storyline in Dishonored is a little too weak. Every twist and turn can be sensed well before they come, and the game makes no qualms about slowly revealing "secrets" as it builds towards its major climax. The way the plot is composed, however, makes the climax massively underwhelming. It happens, and then players are asked to move on. The climax comes in bumps, rather than one major rise towards incredible drama. This is a misstep in an otherwise well executed story. Say "hello" to a great, new IP. The problems born out of narrative miscues and too much emphasis on drab are very minor in the overall weight of Dishonored. This is a return to old school stealth with a brand new onslaught of choice and exploration that makes Dishonored incredibly valuable. The AI and plot detract from the worth of the overall experience, but Dishonored still comes out on top. Gamers who love discovering something new and special need to pick up this brand new IP. My hat goes off to the folks at Arkane Studios; they've started something really special. Hopefully we won't see sequels bogged down with multiplayer and unnecessary additions. This IP is great, and follow-ups won't need to deviate far from the ground it treads. 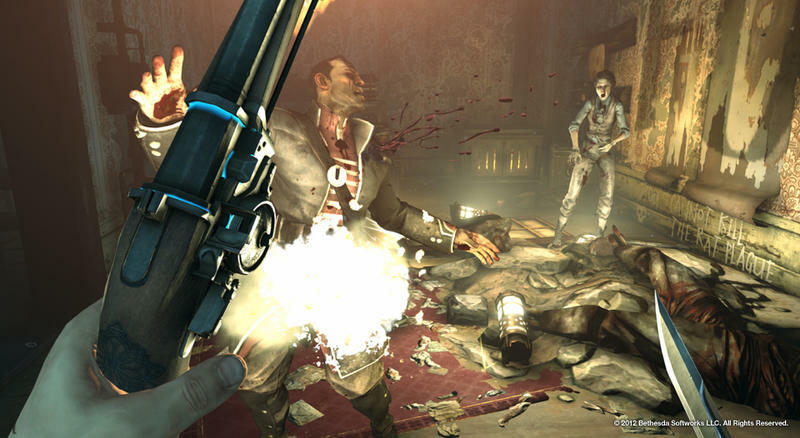 We received a code to activate a Press version of Dishonored for the PC on the Steam platform. The press version is the same as the final build of the game, though it will be deactivated by the end of October. We played the game to completion before starting this review. We beat it in around 10 hours.